Automated logoffs are useful in instant and linked cloned scenarios (hopefully everyone is using instant clones and admiring how awesome they are) where you have to deploy an image update immediately and logoff existing sessions later. Thankfully for my blog readers, I have written such a script to do that. This script utilizes the Get-RemoteSession and Send-SessionLogoff Horizon PowerCLI commandlets. Unfortunately there is no PowerCLI commandlet to send messages to the active sessions, so I had to convert each session’s machine name to a string and do a ForEach loop to pipe those names into the msg.exe command. The other unique thing about this script is that it only does half of the pool at a time (using some variable array magic). The way it’s currently written, it sends a message to half of the sessions that warns them they will be logged off in 15 minutes, warns them again at 60 seconds prior to logoff, logs the first half of sessions off, and then repeats the process with the second half of sessions. Also, if you want to run this script real-time versus scheduling it in Task Scheduler, I have included Write-Host commands along the way so you can actually see which sessions are being warned and logged off throughout the whole process. The only thing you’ll need to do before running the script is adjust the 3 variables at the top: $PoolName (name of the Horizon pool), $FirstWarning (How long of a warning the users get before logoff), and $FinalWarning (The second warning time the users get before logoff). Run this or schedule it on a Connection Server and you’re good to go! Enjoy! # This script logs off any active sessions for a particular pool. This is useful for enforcing image updates. # Simply set the pool name and two warning times below! Schedule it with task manager on a Connection Server. # Currently this script will NOT work if only one session exists due to the array usage in the variables. An IF statement could fix this. # If two or three sessions exist, this script will logoff all sessions due to the half calculation and array locations starting at 0. # Next, set the first warning time prior to the reboot in seconds. 15 minutes = 900 seconds. # Finally, set the final warning time prior to the reboot in seconds. # Send the logoffs to half the sessions! # Send logoffs to the other half! This will likely have a single error since the median session has already been logged off. Let’s finally do something on VMware Horizon! This post will cover how to customize your Connection Server login screen, something that is becoming more important as HTML5 access gains popularity. I could not find any documentation on this, so I dug through to find all of the relevant images and files needed. FYI – this was done on a Horizon 7.2 Connection Server. Paths may vary depending on your version. 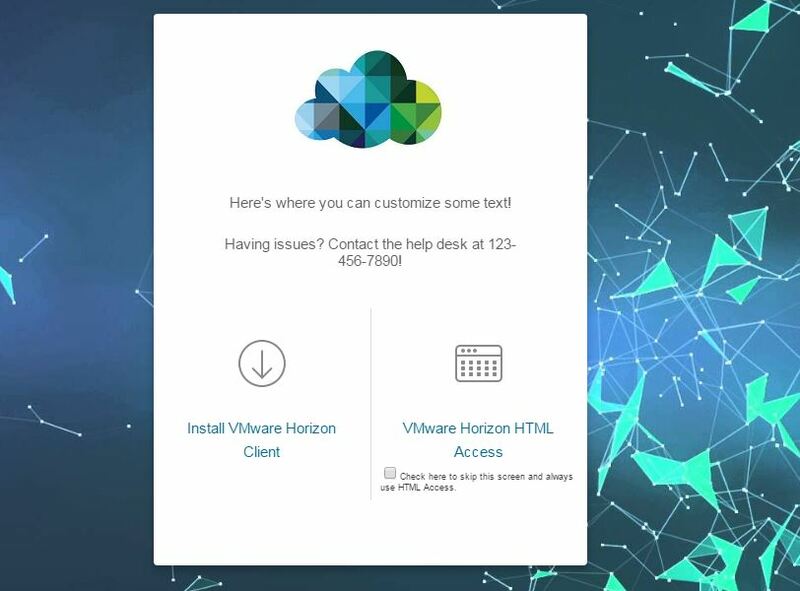 * Requires restart of the VMware Horizon View Web Component service. 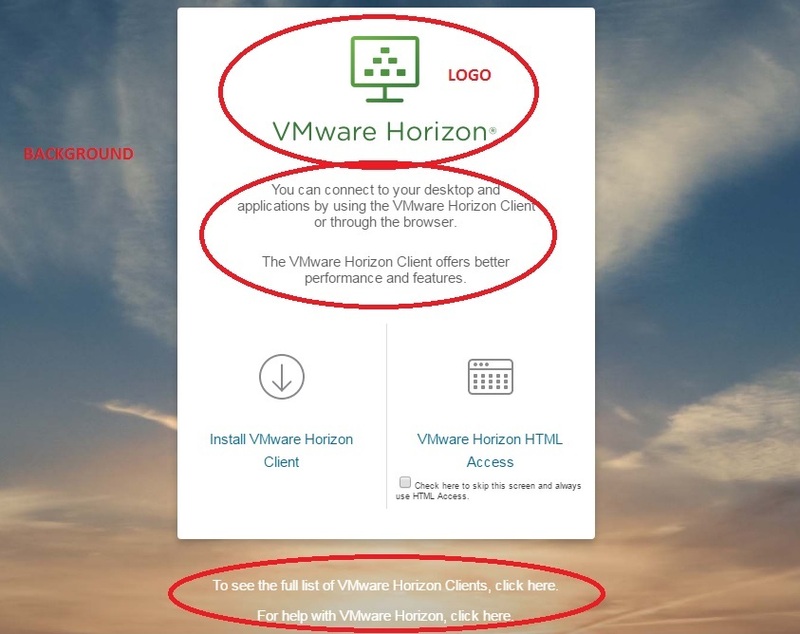 I recommend just restarting the VMware Horizon View Connection Server service or the entire server. I also recommend simply renaming the old files to .old so you always have the original file. Don’t forget to clear your cookies or open in incognito, or else the original images get cached! install.message.first=Here’s where you can customize some text! install.message.second=Having issues? Contact the help desk at 123-456-7890! Here’s what it looks after doing that and replacing the logo and background images. Don’t forget that the background image is .jpg and the logo is .png format; also don’t forget to restart the appropriate service, or just restart the Connection Server. If your Connection Servers are behind a load-balancer, (they are, right?) then you can simply place a different background on each Connection Server so it looks like the backgrounds are randomly generated. Cool, huh?